A while back, I found out about the 24-Hour RPG project and though to myself, "Damn, that's a cool idea." Making a whole game in 24 hours perfectly suited my attention span, so I started thinking about ideas that would make a good one. After sifting through a few in my muddled mind, I decided upon an idea that had occurred to me after reading a Wikipedia article about occultism. Apparently, there's this kind of magic(k) called "Chaos Magic," that works around the idea of paradigm shifting and such. The idea of a modern magic game suddenly seemed really cool. Of course, I quickly realized that stuff like Mage and Unknown Armies had already treaded this ground, but I thought I could do a good job and bring something different to the table. 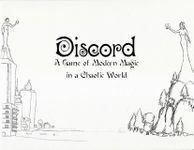 So here it is, Discord, my 24 hour game about modern mages and casting your way through life. Enjoy. Throughout this text, I try to keep the tone light, but within the realm of its material. Since this is a game about magic and mystical stuff, I wanted the text to sound kind of "whoOoOOoO" mysterious. More than likely, it will not quite have that effect, but I hope it remains legible. All you need to play are pencils, copies of the character sheets, and a bunch of six sided dice. You will probably need about 5 per person. ...And everything is permitted. This paradox is the fundamental law of chaos magic. Everyday, everywhere, people are creating their own realities. In every corner, there is the stirring of magic, but most just cannot fathom it. They look at it, all the time, but they do not see it. What does it mean to see? How can anything be permitted if nothing is true? Understanding comes with time and study. At the surface, it simply means that you can see and do anything you want, but nothing you do is absolutely true. There is no higher Truth, no one great force that governs all. There is only you, and your will. There is more to it, however, than simple acceptance. Chaos magic is not about accepting, but about rejecting. First you reject the idea that anything is absolutely True, then you learn that anything can be true. Belief, faith, dogma, and ritual are all tools for the magician to wield. They are clothes that the mage wears to aid in creating er effects. The changing of belief systems, the "paradigm shift" is one of the primary rituals of chaos magic. In this game, you take on the role of a magician. You can be a chaos magician, or you can stick to one paradigm, or something else entirely, whatever works for you. In the next few pages, the various things that make up a character will be discussed. But first, take a look at the character sheet at what a character is made from, then you can explore what the individual parts of each character are.